AMAZONAS, BRAZIL—The plane was cruising 144 feet above the Amazon River, and the door was held shut with duct tape. The roar of the engine and wind through a gap in the plane’s wall—not a window but a half-open door—drowned out most conversation. The door had been left open to allow Antonio Pinto, a field assistant, to hold an antenna as close to the outside world as aerodynamics would allow. It was attached by a cable to a receptor, which was being closely monitored by Pinto and Hilda Pérez, a marine biologist, via headphones. A signal would tell them that Helena, an Amazonian manatee, was still alive. Helena had been missing for about a month, and Pérez was worried. She and Pinto had been tracking Helena since she was released from a manatee rehabilitation center in the Amazon’s Amanã Sustainable Development Reserve on April 13, 2017. Recently, they noticed she’d been swimming close to Castanho, an area notorious for communities with a taste for manatee meat. Her prospects were not good. 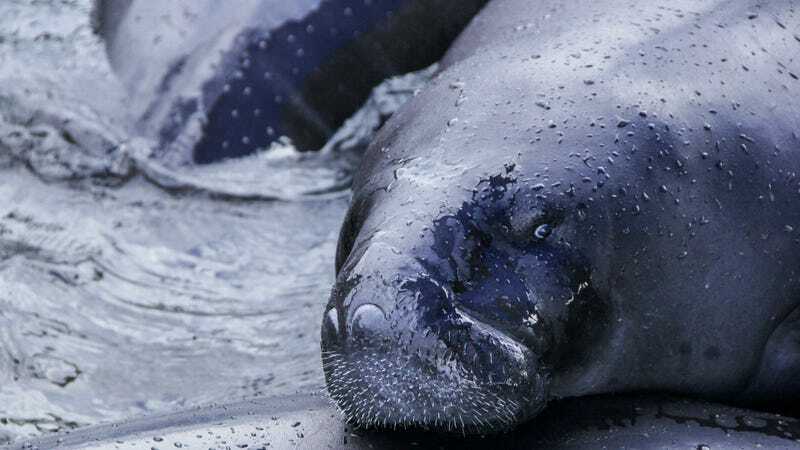 The Amazonian manatee is classed as ‘vulnerable’ by the International Union for the Conservation of Nature (IUCN), and is protected under Brazilian law. Scientists aren’t sure how many manatees are left the wild, but they are convinced that the timid, meaty grazers, experts at hiding among the Amazon’s flora, are declining thanks to a range of human-induced pressures. For Miriam Marmontel, a marine biologist and manatee expert based at the Mamirauá Institute in Brazil, this means that every manatee matters. In 2007, she established the natural rehabilitation centre where Helena had spent the last seven years. The Mamirauá Institute keeps manatees in an enclosure of free-flowing water, and releases them after the shortest possible time, normally around two years. To date, Marmontel has taken in 18 manatees, mostly babies that have been injured by botched hunts or entanglement in fishing nets. Marmontel had wanted to keep Helena in rehabilitation a little longer—she had finally overcome injuries that had hampered her chewing, breathing, and vision, but was still fluctuating in weight. Once Helena was on her own, she’d face dangers in the wild, including hunters, predators, and a difficult seasonal migration. But they had run out of money and could no longer afford the fuel needed to collect food from surrounding areas. On the surface, the outlook for Amazonian manatees now is not as dire as it was in the past century, when records suggest that thousands of manatees were killed in the rainforest every year for their meat and hides, driving the species close to extinction. Manatee hunting was banned in 1973, allowing numbers to recover somewhat. Even illegal hunting seems to be on the wane, as younger hunters from communities along the Amazon river favor gill nets and agriculture over the arduous process of harpooning a shy manatee. Yet, where piles of manatee carcasses once advertised the urgency of the situation, the threats to the species are now insidious, brought about by fossil fuels and big energy businesses. Manatees still need to survive what remains of the hunting tradition, while the likelihood of more severe droughts linked to climate change, alongside dam construction, threaten irrevocable and deadly changes to their Amazonian habitat. According to a recent study in Nature, developers are planning to build at least 428 hydroelectric dams throughout the basin as Brazil seeks to expand its clean energy production. Scientists at the Mamirauá Institute are particularly worried about how these changes could affect the migration of manatees. They have recently found evidence to suggest that these creatures form a finely-tuned cognitive map of their surroundings, on which they plot a route to relative safety, navigating through bottlenecks as the wet season turns dry. When the water is high, manatees live in the Amazon’s floodplains, where they find plentiful food in floating meadows of aquatic plants. But when water levels start to drop, they must find their ways to deeper lakes. To reach such lakes, manatees identify channels through the receding floodplain that they will be able to pass at the very last minute. Leave too early and they abandon the feast of the underwater forest; leave too late and they could be stranded, or easy prey for humans and jaguars. The same research also showed that manatees’ acute sensitivity to the water levels in their river tells them exactly when they should begin their dangerous migration. It’s a delicate balance that could be thrown into disarray by climate change and dams. More extreme droughts and an explosion of hydroelectric dams could cause water levels to change, in some cases making migratory bottlenecks longer and more frequent. Manatees could struggle to revamp their cognitive maps to reflect their changed environment. “It’s an endangered species. We have to care for all of them, if we can,” Marmontel said. To this end, the team has hiked through the forest, dragged canoes across muddy floodplains, and built steps up trees in an effort to locate the signals sent out by the rescued manatees, which they equip with radio transmitter belts upon release. But for Helena, so far, nothing had worked. That is why, on 28 September 2017, the team decided to fly 252 miles down the river in a taped-together plane. When the signal finally went off, Pérez wondered at first if it was a trick of her mind. They were 78 miles away from the last place they’d picked up the manatee’s signal, in an area known as Alberto’s Pipe. She looked at Pinto. It was true: Helena was alive. She had found the migratory route. Pérez had to scream over the sound of the plane to tell Marmontel the good news. “Miriam! Helena—she’s here!” The plane circled back, and the antenna picked up her signal again. “It was the best feeling ever,” Pérez recounted. But then, her feelings have long been attuned to the fate of the manatees. Riding a canoe down the Amazon river in November, she remembered how she cried for half an hour when she first heard how manatees are killed—how the hunter strikes first with a harpoon, how the animal struggles to exhaustion, how it is finally suffocated by conical wooden plugs inserted into its nostrils. The Amazon is changing. Manatee leather is no longer a desirable commodity—what Brazil wants now is energy. For conservationists speaking for the manatees, the opponents are not so much riverine hunters anymore, but government and big business. How long Helena will continue to give off her signal, no one knows. But in the long run, that may be the least of their worries. Sophie Yeo is an independent journalist, who covers climate change, conservation and the environment.